My heart really did just skip a beat. Simply put, today is a big deal. 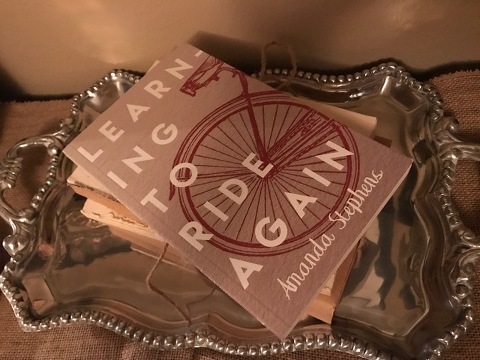 My dear friend, Amanda Stephens, is releasing her memoir today, Learning to Ride Again. But this is not just an important day for Amanda or the people who cheered her on to the finish line. This is a stake-in-the-ground marker day for the readers. If you engage in this book, there’s no doubt you’ll be impacted and renewed on a significant level. I’m thrilled to have Amanda write a guest post for the blog this morning. Ever have weeks when you’re uncomfortable in your own skin? Places we can leave, people we can escape, but unfortunately, we’re stuck in the skin we were born with and the crazy mind and emotional heart it contains. The other night, the simmer turned into a rolling boil of feelings I couldn’t process and situations I couldn’t change. I helplessly bowed my head and began praying for the circumstances beyond my control, only to stop midsentence as a cry of frustration drowned out my autopilot prayers. (Like an audible, wake the neighbors cry). I was done. Done with praying for the very things I’d carried to God time and time again in different ways, with different words – with tears and without. Done! That night, the sun set on my anger. On this day, I didn’t know how to pray so I just took out my Bible and read and read. I read of a shepherd boy who slayed the giant one day and was hunted by a jealous king the next. I read his honest words of fear, and a part of me is grateful that he too was at a loss, for his desperation sounded familiar. I read of a woman weeping uncontrollably with longing for a child after years of barrenness, and I understand her angst for the out of reach. It speaks in ways words cannot. Sticky statements aren’t my enemy, but when identified as the cure instead of the Ibuprofen for my pain, the emptiness I feel is warranted. Sticky statements are the trailer for the movie, the appetizer for the gourmet meal to follow, and the Amazon.com teaser that ends abruptly at the point when you can’t help but click “Add to Cart” or risk losing your sanity at not knowing the rest of the story. But my life is impatient, rushed and hesitant to trust more often than not, and I survive on sticky statements…till I can’t. At that point, even when presented with encouragement or direction, adeptly written, sticky statements fall flat, but it’s not their fault. They were never meant to be substitutes for the ultimate truth.